Not so long ago I taunted you with the promise of cupcakes. I teased you with pictures of the test batches and swore I’d be back with more. I totally dropped the ball and I did not photograph the cupcake process OR the final products. I’m so sorry! 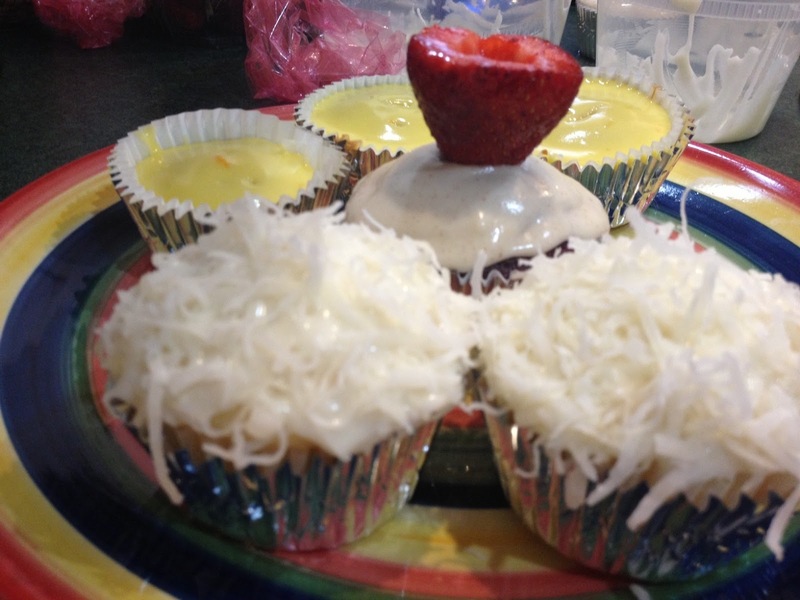 White cake base, whipped cream vodka frosting, topped with coconut. (partially inspired by those Hostess Sno Balls, actually). 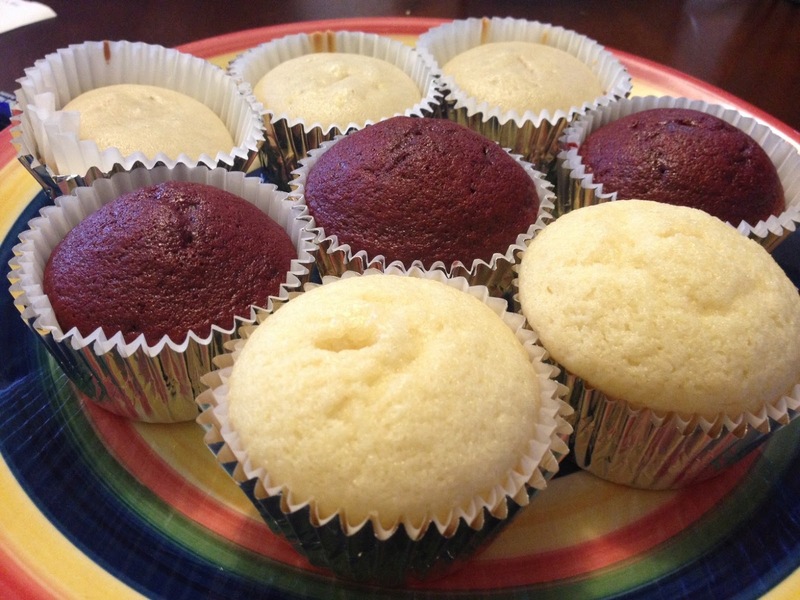 Preheat oven to 350 degrees F. Using a standard cupcake tin, place liners in six cups and fill the remaining six halfway with water (this will protect your pan and keep the cupcakes extra moist). Combine the flour, sugar, baking powder and salt together, add the dry mixture and the butter into the bowl of your mixer (I actually used my food processor and it worked splendidly). Beat until the mixture resembles fine bread crumbs. In a large measuring cup, mix together the milk, vodka, egg whites and vanilla. Slowly pour into the mixer while it is running. Scrape down the sides and mix just a bit more, careful not to over mix. Fill your cupcake liners, bake for 18-20 minutes (I think my oven runs hot, so it may take a tad longer) until a toothpick comes out clean. Red velvet cake base, kicked with cinnamon + cayenne to make a Mexican hot chocolate cake. 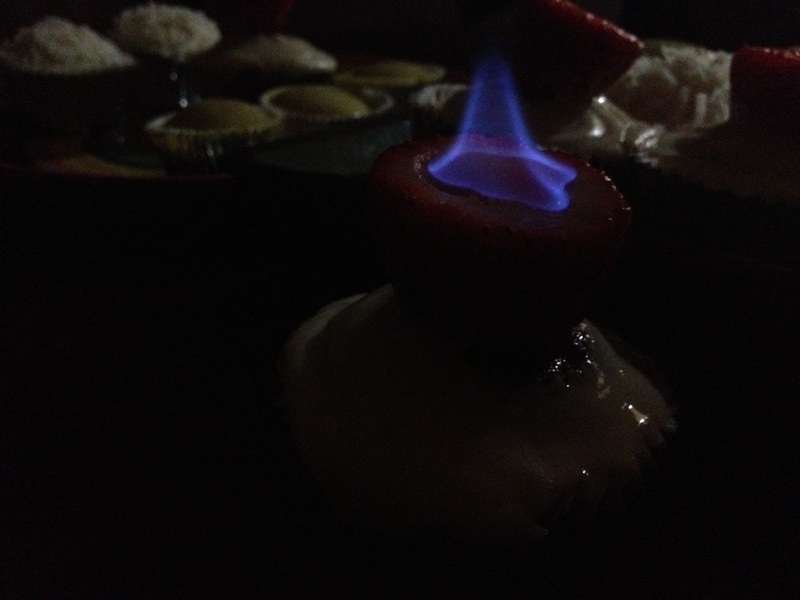 Cream cheese frosting with a flaming strawberry on top. Preheat to 350 degrees F. Line a standard cupcake tin with liners. In a mixer (again, I used my food processor), cream the butter and sugar until fluffy. Add in the egg, be sure to scrape down the sides. In a small bowl combine the cocoa powder, vanilla, red food coloring and vodka to make a paste. Using a spatula add this pasted into the mixer and combine with the sugar/butter/egg. Slowly add in half the buttermilk and half the flour. Scrape down the sides and then add in the other half, mixing until smooth. Stop the mixer and add in the salt, baking soda, vinegar, cinnamon and cayenne. Mix until combined. Fill the liners about 2/3 of the way up and bake for 18-20 minutes, or until a toothpick comes out clean. Yellow blonde ale cake base, lemon cream cheese frosting. Preheat over to 350 degrees F, fill a standard cupcake tin with 9 liners and fill the remaining 3 tins with water. In a medium bowl whisk the egg whites until they form soft peaks (very important, do not underwhisk!). Slowly add in the sugar while you continue to whisk. Continue to add in the remaining ingredients, mixing until smooth. Fill the liners 3/4 of the way (these do not rise much) and bake for 13-15 minutes, until a toothpick comes out clean. For the frosting I adapted the basic cream cheese frosting from the red velvet recipe on Brown Eyed Baker, adding in a splash of whipped cream vodka. I separated the frosting into three parts. For the white cake, I left it as it was. For the red velvet I added in cayenne + cinnamon to taste. For the Blonde ale cakes I added a generous amount of fresh lemon juice + zest so that it was very thinned out, more of a glaze. The piece de resistance was definitely the flaming strawberries! I hollowed them out, filled them with a splash of whipped cream vodka and literally set them on fire. An actual picture from the party! It was very hard to photograph, haha. My Mexican hot chocolate-red velvet cake was definitely the crowd favorite, even without the flaming strawberry, but my guests were impressed by all of them (and we all ate more than our fair share).